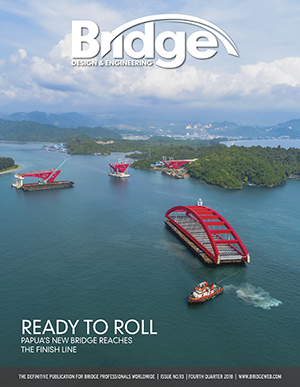 We are offering all our website visitors the chance to review a small example of the respected and engaging editorial from Bridge design & engineering (Bd&e) magazine for themselves. The offer comes in the form of a complimentary 'example' document containing just a small selection of the articles published in our latest issue. Please download your FREE 'example' of the fourth quarter #93 edition here. If you'd like a FREE and complete print copy of our next issue to be delivered straight to your door (around 80+ pages) please contact a.humphries@hgluk.com. And for details of our great deals on 1, 2 or 3-year subscriptions, please visit our Subscribe page. 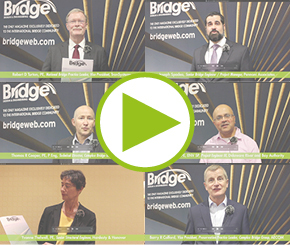 You may also be interested to hear how our readers use their Bd&e subscriptions in their everyday working lives; readers representing organisations such as AECOM, the Delaware River & Bay Authority, Hardesty & Hanover, Pennoni Associates, TranSystems and WSP.